It’s a framed date! Chris and I just took photos of found address numbers (these hail from various spots in Old Town Leesburg), and put them in a matted frame. There are companies that custom-make these for sale, but I think it’s way more fun to do this yourself, and it’s a totally simple but super thoughtful/personalized gift perfect for anyone. You can even do this project as a piece of art for your own home. First, start off with an idea of what occasion you want to commemorate: an anniversary, a baby’s birthday, a vacation date, anything! 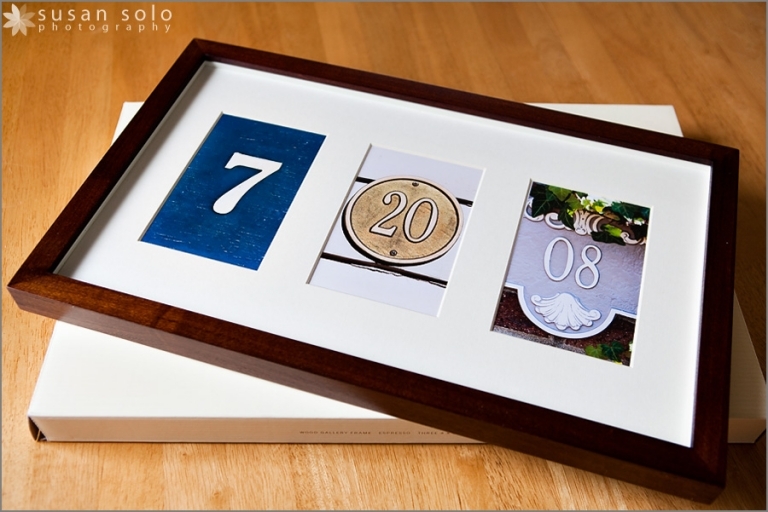 If you want to use the date only, you can easily find a matted frame with three openings for the month, day and year. (Or day, month, and year if you’re British.) I found this one with three vertical openings at Pottery Barn. If you want to do the date along with a special photo, you’ll have to search a little harder to find a pre-matted frame, but something with a configuration like this would totally work. Or of course, you can have your project custom matted and framed at a frame/art store. If you want to use a pre-matted frame, knowing the orientation of the openings in advance will help you to plan your photos. Next, grab your camera and head out on a scavenger hunt for your numbers! Note: If you are forgetful or easily sidetracked like I am, it’s best to write the date down so you know for sure which numbers are needed. Also, you don’t need a fancy camera for this project, but a long lens or a camera with zoom capability might help if your numbers are just out of reach so that you don’t have to trespass. And I knew that my frame had three vertical openings, so I photographed my numbers in portrait (vertical) orientation. Now, where to find these numbers? Old historic downtown areas have tons of interesting address markers on cute little storefronts and surrounding neighborhoods. Walk around and explore. It’s art + gift-giving + exercise all wrapped up into one! Take photos of the same number in different styles so that you can choose your favorites later. When you’re taking the pictures, try to fill the frame with as much of the number as you can, but leave enough of a margin on all sides in case your mat opening is not exactly 4×6 or 5×7, etc. You can always use software like Photoshop to crop the image when you’re ready to print. I happened to like the cheerful colors of the numbers we found so I left the images as-is, but you can also use software to convert the images to black-and-white for a clean and crisp graphic feel that is timeless and sure to go with any decor! And that brings us to the last step – just print your photos and arrange them in the frame! Be sure to use photo-friendly adhesives. I just used acid-free tape to mount the photos behind the mat and voila! Totally personalized custom artwork bursting with meaning. Easy enough, right?! So what date would you frame? Do you have any other fun photo projects to share?